We need a new airport!!! Re: We need a new airport!!! This is going to be a very, very generic airport. Better to put aside any expectations now, and just know we're getting the cheapest thing possible. The city fucked this up so bad. They should be running this project and issuing the bonds. You mean versus the status quo which is to give people expectations that can't be met under the budget given and then costs skyrocket and despite every major public project being the same way people express surprise and disgust at the cost overages? Stop comparing this to the status quo. ffs. Let's design and pay for something we can be proud of. I will wait and see before I make put in my 2 cents. But, for right now, the renderings are of poor quality. SOM must be working on a very tight budget right now. Both B&M, and Aecoms renderings were light years better than these and they hadn't even been paid yet! For all of those who want to give input, I would recommend showing up to the open houses in the coming months. There you can give your direct feedback on the design and everything else. Why shouldn't it be a point of comparison when your argument is we should be doing what we normally do, or in other words, the status quo. Last edited by flyingember on Fri Aug 24, 2018 1:06 pm, edited 1 time in total. None of their renderings were changed yet to account for budget. They were all sky is the limit concepts. I'm not buying what you're selling. I get the argument for the fountain being inside, waste of space. I don't agree with the argument for the scalloped roof. That roof is totally feasible with today's engineering and construction capabilities. Moreover, it isn't even completely unique. There are several other terminals that have fancier roof lines. This could have been achieved with less than a $50 million investment or 3.5% of the overall cost (including the acoustic remediation). I would bet the difference is even smaller like around $10-20 million. If someone wants to prove me wrong, please do, but for either the above prices I think it is worth the investment to have this airport feel world class and include some nice architectural elements to it. So the only real reason it was cut was likely due to funding. Are you sure that roof was visible from inside? What about changing the roof makes it world class? What makes you think there aren’t other aspects that are better places to spend money. I would take $10 million and get the best seating possible instead so when people hit the gate they have a premium experience waiting for their flight. One thing that is always badly done is how to sit down with family and eat snacks or do some work, read or play waiting on layover. If they could change this it would get people’s attentiin. Too bad, really. At least the design for the old KCI was unique and innovative for its time. What we’re getting here is the cheapest and most generic scheme possible, a step from Oklahoma City and on par with every mid-tier city in America. Congrats, KC. So many things went wrong with the marketing of the new terminal. That's what happens when cheap is one of the selling points. I think a lot of that goes back to a very vocal minority (proven to be a very small minority) that put a lot of pressure on the city who thought selling a new KCI would be an uphill battle. As a result, a lot of the focus was put on cost. I am not sure if the relative low cost was a deciding factor or not? In retrospect, I doubt it (KCI's issues were self evident to all that actually used it) and it might have been fairly safe to go after something a little more grand. I could go with a compromise. Just the dramatic roof in the main building, not the concourses. The iconic roof lines at Denver and Dulles are like that. The desired indoor fountain could be just some sort of economical design with water running down a wall. See, that's the difference for me. I think good seats and enough room are required amenities these days, not luxury options. If I'm stuck in an airport, I don't want to feel boxed in by low ceilings or like I'm in anywhere USA. The previous ceiling, as seen in the pictures, would have changed the lighting in the airport at different times of day, would have drawn your eye up and again, been more architecturally pleasing. I don’t disagree, but are you boxed in because the ceiling is flat? Without looking what shape is the ceiling at the airport today? Don’t assume that good seating is a given. That’s the concourse in that rendering of course. There’s a gate towards the right of the image with next to no chairs at it. They’re in yellow way far away and it’s hard to tell, but might seat 30 people. The fancy roof was designed by people who thinks chairs are unimportant. When you expect someone to design fancy, it’s going to be with everything they do. Redoing the design to have space for seating, since they clearly didn’t plan for it, means taking from somewhere else. So the argument is that we hired an architect so incompetent that they didn't plan for seating? And it doesn't have to come from anywhere. Just increase the cost. Seating, airport gates, and a roof: pick two. They all can’t be done. Something has to be dropped and so far it’s the fanciest architecture. More, more, more comes with a cost. It’s not pick two of three. It’s more like pick 42 of 115 things. Yeah, again I don’t think the original roof that was presented was some sort of new architectural achievement. It just wasn’t some flat big box roof. It is interesting and appealing. This is a $1.4 Billion airport terminal, I don’t think a better architectural design is too much to ask for. I agree with Woodrow that our design team should be able to accommodate all the requests you noted above (excluding the fountain that was wasted space). If not, we clearly hired an incompetent architect/design group. My guess is that Edgemoor found out they could save $5-10 million by dumping the roof design and just thought they’d see if they could get away with it, let’s not let them. Let’s demand that this airport be what we want it to be (within reason). We’ve been dreaming about this for nearly a decade. Most of what you said though is just standard airport stuff. People want bathrooms and seats with power? How many focus groups did it take to figure that out? In and out at the curb? That's standard at every modern airport. I guess here is a better question. What are we doing that is unique or better than other recently designed airports? What will we be impressed with? 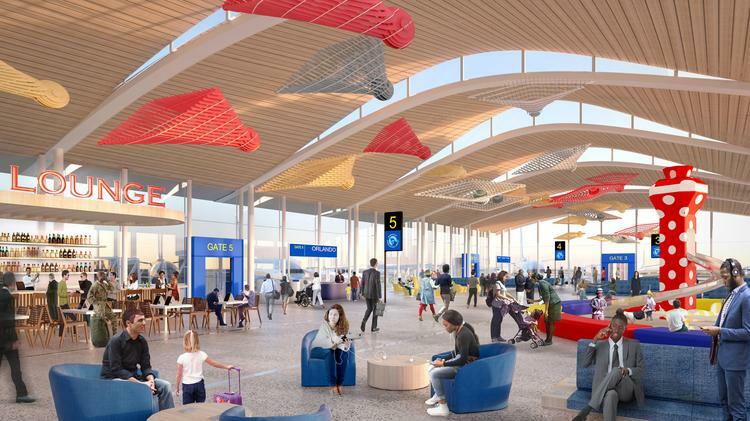 The airlines want this to be as cheap as possible, edgemoor has their built in profit, and the city wants to use it as a slush fund for their constituents. That all leaves very little margin to build anything impressive, let alone above average. SOM is doing exactly what they were told to do - build the cheapest airport they can that meets the airlines needs while allowing edgemoor to make their required profit. That's why I said the expected rejection by the faa was bad news. If they have to pay that out of company funds, they're going to get it back on the other side. Anyone who thinks they're just going to eat millions of dollars is insane.